The good news must go still further. God is so good. We made it safely and on time to Vancouver yesterday. We got up early and flew all day (3 flights) and arrived in Vancouver around 4:00pm, getting to our new apartment around 6:30pm (West Coast Time). We unpacked a little, bathed the kids and sacked out. Today was neat. We walked to McDonald's for breakfast with the boys, then to the nearest grocery store. We loaded up on the staples and walked back to our apartment where we finished unpacking and then had much needed naps. After lunch we (all 6 of us) caught the city bus and rode it 5-10 minutes to a nearby shopping center where we worked on new phone plans and found a bank to exchange some money. On our journey home we stopped at a very nice park and let everyone get a little energy out. Next it was supper time and Sarah cooked a great meal for us, parmesan chicken. The meal was perfect, thought we could tell she hadn't cooked in several months (Richmond had a cafeteria) because she set a dish towel on a hot eye and we quickly had big flames in our kitchen. A little drama is always good. 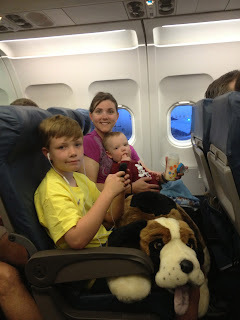 We are so thankful for your prayers allowing us to travel smoothly and for the kids to do well. Their airport training in Virginia really paid off because the two oldest were terrific in the airports. Like sibling professionals they carried luggage, kept close, and watched the little ones when needed. Their only compensation request was a $4.60 bottle of Fiji water in Toronto which Sarah was convinced they had earned. I tried to explain their was endless water in the restroom sink but they would have none of it. They were like a union. Last thing today - Vancouver is unbelievably beautiful. Huge snow capped mountains surround the city (which is on the water) and the air is crisp, the streets clean, the transit on time, and the people friendly. On our first train ride I met a fellow from MN who married a girl from Charleston SC. They moved up here for work 8 years ago and can't bring themselves to leave it. I understand.